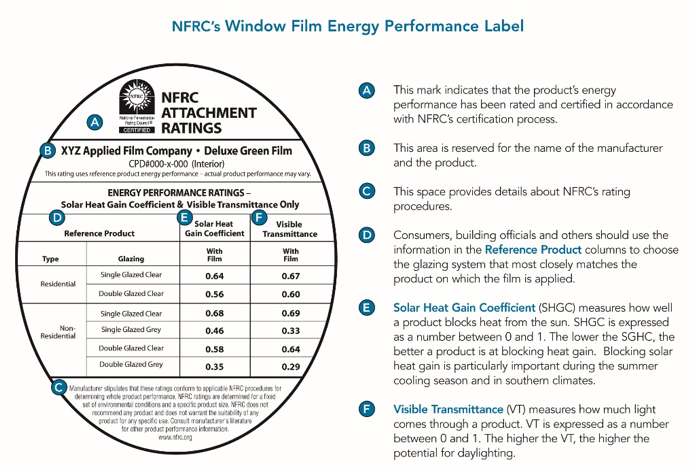 NFRC independently tests, certifies, and labels window films for their energy efficiency. According to the International Window Film Association (IWFA), whether window film is installed on a home, commercial building, government facility, or historic building, it may deliver positive results. These include reducing energy use — especially at peak periods — cutting down on hotspots and glare, helping protect furnishings from fading, and improving the lifespan of a building. The best way to learn more about window film is to get in touch with a professional dealer / installer, distributor, or manufacturer. For more information, contact the International Window Film Association (IWFA). If you make the decision to purchase window film, be sure to look for the NFRC label on the product packaging.